I bet you've said it... yep, you. You've made the dreadful mistake of saying no one in your industry (competitors, vendors, etc...) use content marketing yet. No one baits in high quality prospects with valuable content they've written in hopes of generating leads... OH REALLY!?!?!?!? I'd be willing to bet with a little Googling we can prove you wrong. You just need to know how to start looking. Here's a quick way to do some competitive research on who is using content marketing in your industry. Find the icon on your computer that you click to go to the internet and click it. If that icon looks like this: please do yourself a big favor and download Google Chrome (looks like this: ). It's a much better web browser than Microsoft Internet Explorer. In fact, it's even better than Mozilla Firefox which looks like this: . Here's some solid market share data to prove it: This chart comes from the W3C Schools website, which is a voice of authority for anything Internet. This should be fairly strait forward... Find the address bar. Type google.com in the address bar and hit Enter on your keyboard. This is where the research actually begins. Let's type a keyword or phrase that someone in your industry might use to entice a website visitor to click and download their content. For example, let's say we're in the powdered metal industry. 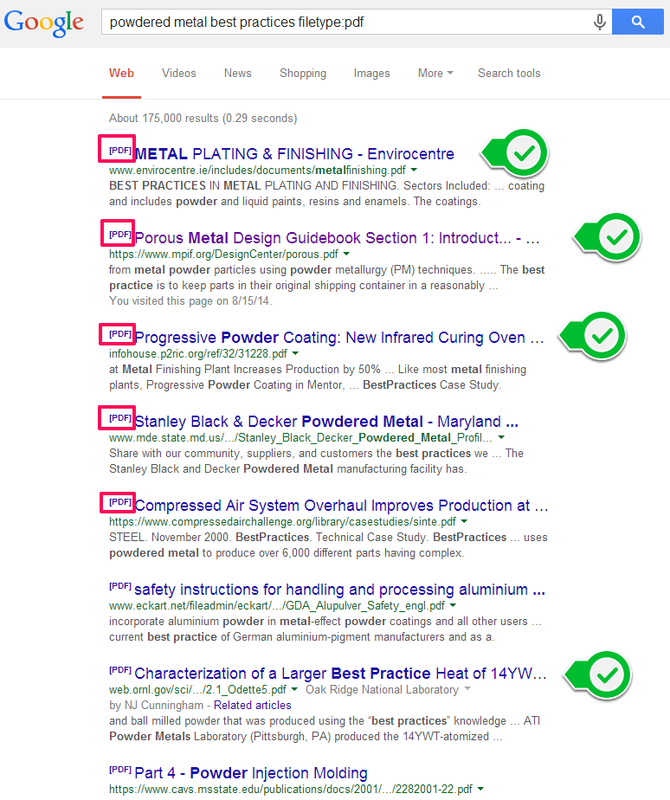 We might go to google and type something like this: The search term "powdered metal best practices" could be a search phrase that a prospective client might use to learn a bit about powdered metal before looking for a supplier. As a powdered metal manufacturer, It would be valuable to be the resource that this prospect finds, wouldn't it? You might say, well, that search is too vague. OK, add in an industry like "automotive powdered metal best practices" and you are targeting a bit better. When you do this search, you will see tons of content results like so: This list of results isn't as valuable as we could get to really hone in on content marketing in your industry. The next step will get us to where we want to be. As I said above, the list of results is not perfect for finding industry mates that are using content marketing. Again, companies doing content marketing tend to post their lead bait as PDFs, so we can modify our original search, just slightly to find ONLY PDF files by adding a file type filter to the query like so: filetype:pdf: Now the search engine results page shows the following: Notice, all of the results returned are PDFs. Also, notice that many of the PDFs appear to be content marketing in nature. 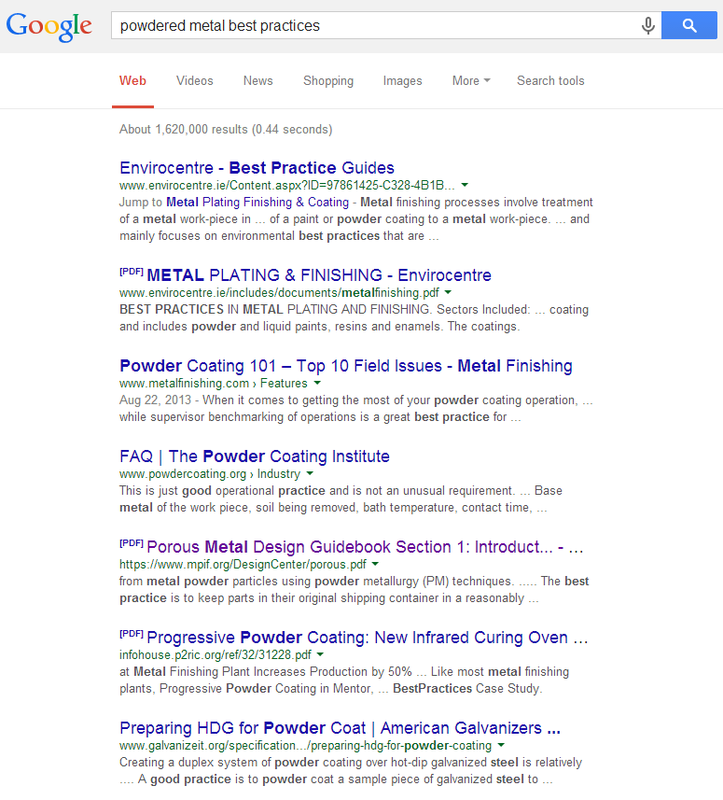 Result 1's description clearly states "Best practices in metal plating and finishing". By simply clicking on each of these links, we can see what the PDF is fully about. See!?!? Your industry does use content marketing. Some of them may not be smart enough to ask for lead information in return for this content, but you will be. You will be the company that actually gets results from content marketing in your industry. Maybe your industry is heavily into Infographics. That's cool. Change the filetype filter to png or jpg and you will find image results for the same search phrase. Content is more than images and pdfs though. You shoudl also be sure to look on YouTube for videos that might be used as content marketing. The bottom line is that your industry IS using content marketing. Doing a little research will easily prove it.